Dr Sinéad McNally (DCU), Dr Gráinne Walshe (UL), Prof Merrilyn Goos (UL), Minister Halligan, Margie McCarthy (SFI), Judith Harford (UCD); and Brendan Tangney (TCD). 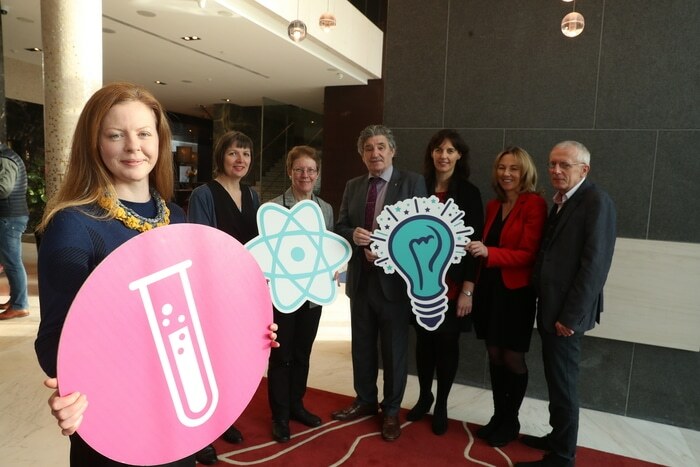 Two UL initiatives aimed at encouraging and supporting women in STEM education were today awarded Science Foundation Ireland funding. Minister for Training, Skills, Innovation, Research and Development, John Halligan TD, announced a national investment of €3.6 million through Science Foundation Ireland’s Discover Programme, to fund projects dedicated to educating and engaging the public in science, technology, engineering and maths (STEM). Science Foundation Ireland, through its SFI Discover Programme, aims to develop a highly-engaged and scientifically-informed public. Through the SFI Discover Awards, it provides funding for projects that inspire and guide the best in STEM education and public engagement. 41 diverse initiatives will be supported by this year’s programme, with successful awardees being carefully selected through international peer-review. A further 11 projects that were awarded in 2017, will also have their funding continued for a second year. SOPHia: Science Outreach to Promote Physics to Female Students (UL) - a project that aims to encourage female students to take up physics as a Leaving Certificate Subject. STEMChAT – Women as catalysts for change in STEM education (UL) – looks at the recruitment of female undergraduate STEM Champions and industry mentors who will facilitate informal workshops with school students and parents, predominantly in disadvantaged areas. Engaging Girls in CS - Code Plus (TCD) – Female-only coding workshops facilitating a cohort of female speakers working in computing, to deliver career talks in girls’ schools. Tech companies will host visits for teenage females. Girls in DEIS Schools: Changing Attitudes /Impacting Futures in STEM (UCD) - Students will engage with STEM by exploring the lives and impact of several female STEM pioneers, both historical and contemporary. Science Foundation Ireland has invested in over 240 public engagement projects through the Discover Programme since 2013. This year’s funded initiatives are estimated to reach over two million people.